Copyright: © 2016 Kalinova D, et al. This is an open-access article distributed under the terms of the Creative Commons Attribution License, which permits unrestricted use, distribution, and reproduction in any medium, provided the original author and source are credited. Autoimmune myositis is a syndrome, characterized by involvement of the cellular and humoral immune systems in skeletal muscle pathology, response to immunotherapies, and the presence of autoantibodies (Abs) (myositis-specific and myositis-associated Abs) in the serum of some patients. Myositis-specific Abs are found almost exclusively in patients with myositis and are associated with definite subsets of myositis characterized by distinct clinical features. It has been suggested that myositis-specific Abs may serve as a diagnostic serologic marker for different specific subset. A new Abs, called anti-NXP-2 Abs, has been identified in juvenile dermatomyositis (JDM) patients, and it was associated with severe muscle weakness, polyarthritis, joint contractures, and interstial vasculitis. Anti-NXP-2 Abs are also found in adult polymyositis/dermatomyositis (PM/ DM). We present a clinical case of 39-years old female patient with distinct subset of dermatomyositis with positive anti-NXP-2 Abs, clinically characterized by marked calcinosis with "ulcerations", typical skin lesions (heliotropic rash, Gottron papules), proximal muscle weakness, without internal organ damage. Autoimmune myositis is a syndrome, characterized by involvement of the cellular and humoral immune systems in skeletal muscle pathology, response to immunotherapies, and the presence of autoantibodies (Abs) (myositis-specific and myositis-associated Abs) in the serum of some patients . The myositis-specific Abs is interesting in a pathogenetic context not only because they are found almost exclusively in patients with myositis but also because they are associated with definite subsets of myositis characterized by distinct clinical features . It has been suggested that myositis-specific Abs may serve as a diagnostic serologic marker for different specific subset . A new Abs, called anti-NXP-2 Abs, has been identified in juvenile dermatomyositis (JDM) patients [4,5] and it was associated with severe muscle weakness, polyarthritis, joint contractures, and interstial vasculitis . The target of anti-NXP-2 Abs was identified as a nuclear protein called NXP-2, which plays important roles in diverse nuclear functions . Anti-NXP-2 Abs reported in JDM is also found in adult polymyositis/ dermatomyositis (PM/DM). We present a clinical case of 39- years old female patient with dermatomyositis, characterized by marked calcinosis with “ulcerations” and positive anti-NXP-2 Abs. In May 2010, the patient presented for the first time with macula erythema over the face, polyarthritis, affected small joints of the hands (PIP, MCP) and the wrists, Raynaud’s phenomenon, the abnormal laboratory findings, including positive antinuclear antibodies (ANA), with a titer of 1:320. It was diagnosed systemic lupus erythematodes, as therapy with oral corticosteroid and Hydroxychloroquine (Plaquenil®) had been started, as in the course of the treatment it was found out discreet formations of calcium deposits in the elbow pits and inguinal folds. It was supposed as a differential diagnosis overlap syndrome between systemic lupus erythematodes and progressive systemic sclerosis. In November 2010, while the patient was taking Methylprednisolone (8 mg/day) and Hydroxychloroquine (200 mg/day), she developed progressive general muscle weakness, especially marked in the proximal muscle groups-upper and lower-extremity muscle weakness, dysphagia, flare of the arthritis, affected the elbows, knees. Laboratory findings revealed increased serum levels of the muscle enzyme creatinin phosphokinase CPK>800 U/l (normal 24-170 U/l). Because of progressive course of the muscle weakness it was made an electromyography, which showed a myopathic pattern of abnormality. Muscle biopsy was performed, as the muscle biopsy specimen demonstrated mononuclear inflammatory infiltrates, marked vasculitis, homogenous thickened capillary walls, obturation of the lumen, perivascular fibrosis, focal necrosis (Figure 1). It was diagnosed active myositis, as in differential diagnosis we discussed overlap syndrome – myositis associated with systemic lupus erythematodes. The methylprednisolone dosage was increased to 60 mg/day/i.v. and Plaquenil (200 mg) was continued. One month later, the CPK value had normalized and the muscle strength had improved, as the methyprednisolone was tapered gradually. The patient was maintained on methylprednisolone 8 mg/day and plaquenil 200 mg/day for two years. In the autumn 2013, she presented in our institution (Clinic of Rheumatology, MHAT “St. Ivan Rilski”, Sofia) with complaints of mild proximal muscle weakness, heliotropic rash, erythematous rash over the dorsum of the proximal interphalangeal joints and metacarpophalangeal joints (Figure 2), macular erythema over the face and the anterior chest, marked calcinosis with “ulcerations” in the armpits, elbow pits, forearms, inguinal folds, thighs and buttocks and flexion contractures (150) of the knees. The calsinosis confirmed on the X-rays (Figure 3). It was made a skin biopsy, which showed acantosis, sparing mononuclear cellular infiltrates in the dermis, without accumulation of hyalinised collagen. It was found a solid nodule in the right breast, as peripheral lymph nodes were not enlarged. Pulmonary and cardiac-vascular systems showed no pathological abnormalities. Figure 1: Marked vasculitis, homogenous thickened capillary walls, obturation of the lumen, perivascular fibrosis, focal necrosis. Figure 2: Erythematous rash over the dorsum of the proximal interphalangeal joints and metacarpophalangeal joints (Gottron’s papules). 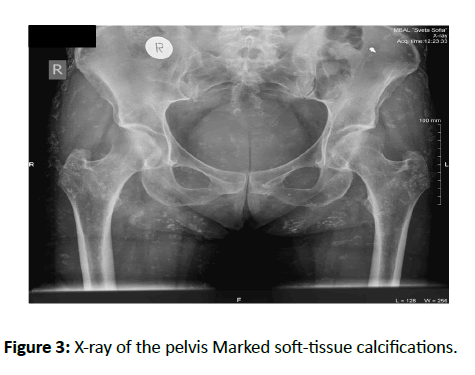 Figure 3: X-ray of the pelvis Marked soft-tissue calcifications. Laboratory findings showed increased erythrocytes sedimentation rate (30 mm) (normal<15 mm), C-reactive protein 13 g/l (normal<6 g/l) and normal serum levels of creatinine phosphokinase 35 U/l. By reason of the positive antinuclear antibodies (ANA) by indirect immunofluorescence with a titer of 1:640 (<1:80), it was tested many antibodies against different nuclear and cytoplasmic antigens by ELISA method and Immunoblot test (RNP/Sm; Sm; SSa; Ro52; SSb; Scl-70; Pm/Scl; Ku; CENT-B; PCNA; dsDNA; nucleosomes; histoni; Rib-P; Mi-2alpha; Mi-2beta; TIF1gamma; MDA5; NXP2; SAE1; Jo-1; SRP; PL-7; PL-12; EJ and OJ). It was found positive anti-NXP2 Abs. Idiopathic dermatomyositis: Overlap syndrome – myositis associated with progressive systemic sclerosis (features characterized by systemic sclerosis in the case – Raynaud’s phenomenon, calsinosis, flexion contractures). Paraneoplastic dermatomyositis: It was made breast ultrasound and mammography because of the solid mass in the right breast. A fibroadenoma glandulae mammae was diagnosed through imaging tests. Gynecological status, abdomen ultrasound and chest X-ray showed no pathological changes. At the end, we diagnosed definite subset of dermatomyositis characterized by soft-tissue calcifications, complicated with “ulcerations” and positive anti-MJ Abs. Treatment and follow-up: It has been started therapy with topical and oral corticosteroid, Methotrexate 15 mg/week and Hydroxychloroquine 200 mg/day. At this time, she continues routine clinical follow-up. The current case report presented a patient with distinct and rare subset of dermatomyositis, characterized by typical skin lesions (heliotropic rash, Gottron papules), proximal muscle weakness, marked calcinosis with “ulcerations”, without internal organ damage and positive anti-NXP-2 Abs. Over the last few year, novel myositis-specific antibodies have been identified, including anti-TIF1-γ (anti-155/140), anti-p140 (anti-NXP2, anti-MJ), anti-SAE, anti-CADM-140 and anti-200/100. Several studies in adult’s myositis have widely demonstrated the association between these Abs and clinical subset within the autoimmune myositis spectrum, as well as their potential value in predicting clinical outcome (the association with malignancy or with development of severe cutaneous disease). The anti-NXP2 Abs were described the first time in children’s with dermatomyositis [4-10] as subsequently the anti-NXP2 Abs were detected in adults with myositis . The NXP2 Abs, originally termed anti-MJ, is uncommon in adults (1.6% of patients) . Conversely, it seems to be more frequent in juvenile dermatomyositis, being described in 15-25% of the affected children’s [13-15]. Several studies [10,15] in adult’s myositis have demonstrated dermatomyositis associated with positive anti-NXP2 Abs, characterized by: pathognomic signs in dermatomyositis - heliotropic rash, Gottron papules marked calcinosis myositis affected by immunosupressive therapy without damage internal organs. A systemic review of the published data was performed clinical cases of patients with NXP2 associated myositis, characterized by arthritis of the large joints, dysphagia, contractures and skin vasculitis . The most striking aspect observed in some cohorts is that anti-NXP-2 positive patients have a higher prevalence of malignancy . Evidence suggested that NXP2 autoantigen might be a nuclear matrix protein involved in nuclear transcription, essential for regulatory the activation of tumor suppressor gene p53, which codes for a protein that regulates the cell cycle [12,15]. The p53 tumor suppressor protein prevents the growth and survival of potentially malignant cells, through induces cell cycle arrest and apoptotic cell death . Until now it was proved association between anti-TIF1-γ Abs and development of malignancy in patients with myositis [3,12,15,19]. Commonly between anti- TIF1-γ and anti-NXP2 Abs are antigen targets, which were identified as transcription factors, playing an important role in regulation of the transcription in the cells [12,15,19,20]. It has been suggested that anti-TIF1-γ and anti-NXP2 Abs suppress the function of some regulatory proteins (p53 protein), as disturb intracellular processes, mechanisms of apoptosis and some cells acquire malignant potential [18,20-22]. By reason of published data and suspected solid mass in the right breast, in the process of diagnosis, the patient was tested for carcinoma, which hasn’t been diagnosed at this moment. Lack of malignancy in anti-MJ positive patient in the current clinical case may be related to young age of the patient (39 years old) compared to anti-MJ (+) patients with malignancy reported (ages 54 to 68) . This may be similar to a strong association of anti-p155/140 with malignancy in middle- to old-age DM but not in children or young adults [23,24]. The majority of cases of dermatomyositis are idiopathic, but in approximately 15-30% of cases of adultonset dermatomyositis, an underlying malignancy is the cause of a paraneoplastic syndrome manifestated as dermatomyositis [25-27]. Other interesting aspect in the current clinical case is the marked calcinosis. Calcinosis is a rare feature in dermatomyositis with adult-onset . In dermatomyositis, calcification occurs three times more commonly in juvenile dermatomyositis than in the adult-onset form and may be observed in 40-70% of patients . Anti-NXP-2 Abs are associated with specific clinical features in DM patients, similar to those identified in British patients with JDM, such as severe calcinosis, skin disease but no internal organ involvement . It is possible the relationship between the present clinical case and anti-NXP-2 Abs could be a simple coincidence. Further studies with larger cohorts of patients with anti-NXP-2 antibodies are required to better understand clinical associations, etiopathogenesis and mechanisms of disease development. Koenig M, Fritzler MJ, Targoff IN, Troyanov Y, Senécal JL (2007)Heterogenity of autoantibodies in 100 patients with autoimmune myositis: insights into clinical features and outcomes. Arthritis Res Ther 9: R78. Nagaraju K, Plotz PH, MillerFW (2011) Inflammatory muscle disease: etiology and pathogenesis. In Rheumatology, ELSEVIER, Toronto, Canade149: 1523-1535. Kaji K, Fujimoto M, M Hasegawa, Kondo M, Saito J, et al. (2007) Identification of a novel autoantibody reactive with 155 and 140 kDa unclear proteins in patients with dermatomyositis: an association with malignancy. Rheumatology (Oxford) 46: 25-28. Oddis CV, Fertig N,Goel A, Espada G, Confalone M G et al. (1997) Clinical and serological characterization of the anti-MJ antibody in childhood myositis. J Rheumatol40:S139. Gunawardena H, Wedderburn LR, Chinoy H, Betteridge ZE, North J, et al. (2009) Autoantibodies to a 140-kd protein in juvenile dermatomyositis are associated with calcinosis. Arthritis Rheum 60: 1807-1814. Targoff IN, Trieu EP, Levy-Neto M, Fertig N, Oddis CV (2007) Sera with autoantibodies to the MJ antigen react with NXP2. Arthritis Rheum 56: S787. Ceribelli A, Fredi M, Taraborelli M, Cavazzona I, Franceschini F, et al. (2012) Anti-MJ/NXP-2 autoantibody specifity in a cohort of adult Italian patients with polymyositis/dermatomyositis. Arthritis Research&Therapy14: R97. Moreira Lobo IM, Machado S, M. Teixeira, M. Seroles. (2008) Calcinosis cutis: A rare feature of adult dermatomyositis. Dermatology Online Journal 14: 10. Boulman N, Slobodin G, Rozenbaum M, Rosner I. (2005) Calcinosis in rheumatic diseases. SeminArth Rheum 34: 805-812. Gunawardena H,Betteridge ZE, McHugh NJ (2008) Newly identified autoantibodies: relationship to idiopathic inflammatory myopathy subsets and pathogenesis.CurrOpinRheumatol 20: 675-680. Betteridge ZE, Gunawardena H, Chinoy H, Venkovsky J, Allard SA et al. (2009) Autoantibodies to the p140 autoantigen NXP-2 in adult dermatomyositis. Arthritis Rheum 60: S304. Tansley S, McHugh NJ, Wedderburn LR. (2013) Adult and juvenile dermatomyositis: are the distinct clinical features explained by our current understanding of serological subgroups and pathogenic mechanisms? Arthritis Research&Therapy15: 211. Espada G, Maldonado Cocco JA, Fertig N, Oddis CV(2009) Clinical and serologic characterization of an Argentine pediatric myositis cohort: identification of a novel autoantibody (anti-MJ) to a 142-kDa protein. J Rheumatol 36: 2547-2551. Shah M, Mamyrova G, Targoff IN (2013) The clinical phenotypes of the juvenile idiopathic inflammatory myopathies. Medicine (Baltimore) 92:25-41. Tansley S, Betteridge Z, Gunawardena H(2012) Clinical differences between adult and juvenile dermatomyositis associated with anti-NXP-2 autoantibodies. ACR Abstract. Ishikawa A, Muro J, SigiuraK , M. Akiyama (2012) Development of an ELISA for detection of autoantibodies to nuclear matrix protein 2. Rheumatology, first published online: March 16, 2012. Ichimura Y, Matsushita T, Hamaguchi Y, Kaji K, Hasegawa M, et al. (2012) Anti-NXP2 autoantibodies in adult patients with idiopathic inflammatory myopathies: possible association with malignancy. Ann Rheum Dis 71: 710-713. Takahashi K, Yoshida N, Murakami N, Kawata K, Ishizaki H, et al. (2007) Dynamic regulation of p53 subnuclear localization and senescence by MORC3. MolBiol Cell. 18: 701-1709. Targoff IN, Mamyrova G, Trieu EP, Perurena O, Koneru B, et al. (2006) A novel autoantibody to a 155-kd protein is associated with dermatomyositis. Arthritis Rheum 54 3682-3689. Betteridge ZE,Gunawardena H, McHugh, NJ (2011) Novel autoantibodies and clinical phenotypes in adult and juvenile myositis. Arthritis Research&Therapy 13: 209. Mimura Y, Takahashi K, Kawata K, Akazawa,Inoue N (2010) Two-step colocalization of MORC3 with PML nuclear bodies. J Cell Sci 123: 2014-2024. Targoff IN, Trieu EP,Levy-Neto M, Prasertsuntarsa E, Miller FW(2006) Autoantibodies to transcriptiptional intermediary factor 1-gamma (TIF1-g) in dermatomyositis(abstract). Arthritis Rheum. 54:S518. Gunawardena H, Wedderburn LR, North J, Betteridge Z, Dunphy J (2008) et al. Clinical associations of autoantibodies to a p155/140 kDa doublet protein in juvenile dermatomyositis. Rheumatology (Oxford) 47: 324-328. Fujimoto M, Hamaguchi Y,Kaji K, Matsushita T, Ichimura Y, et al. (2012) Myositis-specific anti-155/140 autoantibodies target transcriptional intermediary factor 1 family proteins. Arthritis Rheum 64: 513-522. Callen J (2002) When and how should the patient with dermatomyositis or amyopathicdermatomyositis be assessed for possible cancer? Arch Dermatol138: (7) 969-971. Callen, J, Wortmann RL (2006) Dermatomyositis. Clinics in Dermatology24: 363- 373. Peixoto D, Costa J, Ferretti M, Malattia C, Martini A (2013) New autoantibodies and their clinical associations in juvenile myositis – a systemic review. ActaReumatol Port 38: 234-241.